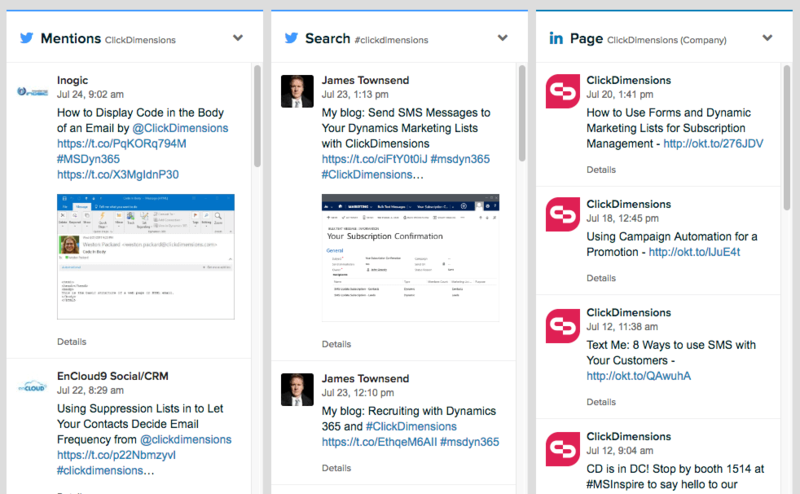 Whether you want to engage or discover, ClickDimensions helps you do more with social media – right from within Dynamics 365! Our social tools help you connect your marketing activities with popular social channels. Post to your company’s Facebook, LinkedIn, Twitter and Google+ accounts right from Dynamics 365, and always keep your followers up to date. Posts can be set to go live immediately or at a scheduled time, and you can view the status and content of your posts directly in CRM. 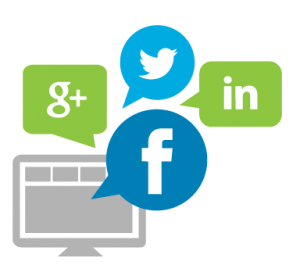 ClickDimensions social engagement is designed specifically for B2B marketers who need smart, time-saving solutions that maximize their social media ROI. This powerful platform is an add-on module to the ClickDimensions marketing automation solution and is available in standard and professional level packages. Social engagement allows users to manage all their social media activity — including scheduling, publishing, analytics and reporting, content curation, listening, campaign tracking and advocacy programs. Gain valuable insights about leads and contacts as you view their CRM records with data and direct links from sites such as Facebook, Twitter, YouTube and Flickr. 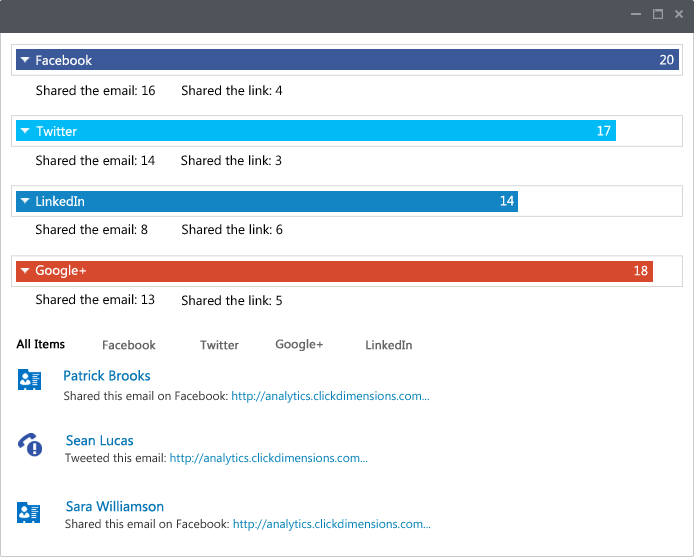 View this information on the ClickDimensions profile, or easily embed social profiles anywhere on your Dynamics 365 lead and contact records. Expose your email marketing to new audiences by allowing recipients to share your emails on their Facebook, Twitter, LinkedIn and Google+ social profiles. See which recipients have shared an email on which networks with our social sharing report. Social linking allows you to easily connect your organization’s social profiles to your email marketing messages so recipients can quickly find you on social. Linking options include Facebook, Twitter, Google+, LinkedIn, blog, Instagram, Pinterest and YouTube.